These are the music classroom rules I use in my room. I wanted something with a POSITIVE message, so instead of rules that tell the students "don't do this", these rules tell them to "Be" all these things! Plus they can be said in rhythm, hence I call them the RHYTHM RULES. There are 8 rules total, plus the Rhythm Rules title. This pdf file is FREE and is formatted to be printed out on Legal sized paper. These are four grade-level specific Music Fortune Tellers (2nd-5th Grades). It helps the students to learn music symbols/concepts in a fun and exciting way. They can partner up and take turns quizzing each other. This is great for end of year review before testing! There is also a fortune teller folding instruction page included. Turn your music room into a baseball field! (Cut out some cardboard for bases, or get a nice foam set at the dollar store.) TO PLAY: Split the class into 2 teams. Flip a coin to see who goes first. One by one, players step up to the plate and take a turn at bat trying for either: a Single, Double, Triple or Home Run. They are shown 3 rhythms or melodies. The teacher plays one. If the student guesses correctly, they advance to the appropriate base. If they guess incorrectly, they’re out! The 1st Half of the game is Rhythm. The 2nd Half of the game is Melody. PLAY BALL! "Pot of GOLD" is a grade-level specific PowerPoint music assessment game! Split the class into teams. Flip a coin to see which team goes first. Teams alternate answering questions: Choose a COLOR and a LETTER. After answering, the board will reveal how many coins the question was worth! If you answer correctly, you receive either 1 coin or 3 coins. If you answer incorrectly, you receive nothing. To win, earn the most coins! GOOD LUCK! This is a super fun game to play with your students to assess their knowledge of musical concepts like notes, rests, symbols, tempo words and dynamic markings. It's in PowerPoint format with 30 questions total. At the beginning of the game, split the class into two teams (A&B). Each team takes turns answering questions as they travel around a world map! If they answer correctly, on their next turn they advance to the next question. If they answer incorrectly, on their next turn they must repeat that question again. The team that makes it to the end first wins! This is a PowerPoint lesson that teaches students the solfege pitches with a fun story about trick-or-treating on music street! It's Halloween night and the 8 houses on music street each hand out a special treat! Your students will learn that each house has a different name and different sound. They can even sing along! This is a MUST for teaching solfege. Your Kiddos will LOVE it! "Trick-or-Treat On Music Street" is embedded with sounds, contains a review half-way through, and it has a special interactive final slide! This game is a lot like the game CLUE! Your students are Detectives on a mission to discover which Instrument of the Orchestra is the CRIMINAL! Using the Instrument Suspect cards, students interview one another and record their findings in their journal. By "process of elimination", they eventually figure out which is the criminal instrument. There is a front/back sheet with instructions (to be folded) which acts as the Detective's Journal, and 24 Instrument Suspect Playing Cards that includes a sheet to be used for the backs of the cards. Simply print out, cut and laminate! This is a super fun musical version of the classic Memory Matching Game. Simply open the PowerPoint presentation and display the board of numbered tiles (1-32). One at a time, ask students to choose 2 numbered tiles. Click on the tiles and they will flip over to reveal a musical term/symbol. If the tiles do NOT match, click on them again, and they will turn back around to reveal the number again. However, if the tiles do match, leave the tiles as they are (my students get a skittle for getting a match). GOOD LUCK! This is a super fun instrument bingo game where each column on the Bingo card represents a different instrument family! B=Woodwinds, I=Strings, N=Brass, G=Keyboards, O=Percussion. You get a 33 page PDF document with: 24 Bingo cards, 38 Instrument Calling cards, a Bingo Game sheet for the backs of the cards, and a Reference page listing all 38 Instruments represented in the game. 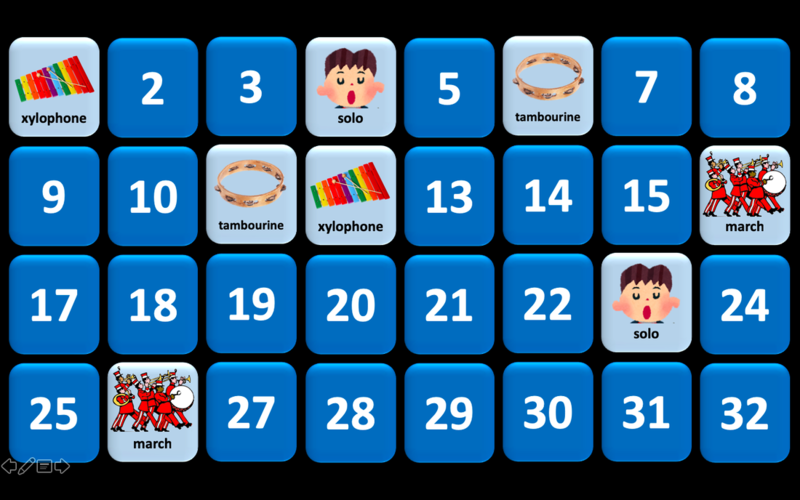 You also get the PowerPoint that was made to accompany the Instrument Bingo Game containing a Bingo Reference Board listing all 38 instruments and links to slides with instrument sound clips! Enjoy!!! to see more of my lessons! This Fortune Teller activity teaches the 4 Families of Instruments of the Orchestra (Brass, Woodwind, String, Percussion) It is 2 pages to be printed double sided onto one sheet. On one side, the students color the instruments and on the other side they classify the instruments into their families and answer questions about the orchestra. Once they are finished, they can fold it into a FORTUNE TELLER and quiz each other! This is a set of 3 worksheets relating to Music Symbols. There is a 30-Word CROSSWORD PUZZLE with across/down clues and a word bank. There is a MUSIC CODE BREAKER sheet with a 6-Sentence code breaker story and a code breaker riddle. And finally there is a 20-symbol worksheet where students can practice drawing the music symbols. This set also includes the answer keys for the CROSSWORD and CODE BREAKER sheets! Blog with grade-level music lesson plans! Great teacher resource for all the Arts! Music, Art and Theatre lesson plans! Children's songs, games and learning activities! World Music lesson plans from The Smithsonian! Hundreds of songs with lyrics and instrumental tracks! Games, activity ideas and resources. Songs, dances, activity ideas and resources. Movement ideas for the elementary classroom. Create crossword puzzles and word searches for free!